Whether it’s as a side for dinner tonight or a potluck with friends, this refreshing salad is sure to satisfy! The prunes add bone-helping nutrition. Disclosure: This blog post is sponsored by Sunsweet as part of the brand’s “I Eat Right Because” social media campaign. All opinions are my own, as always! Eating right is important to me not only because I’m a registered dietitian nutritionist, but also because I feel good when I eat right. Nutritious food powers me, and that allows me to have so much more energy to exercise and enjoy the time I spend with loved ones and friends. The weather is starting to warm up, which has me thinking about refreshing salads. I’ve always been a big salad fan (back in college, I used to munch on a bowl of greens as a midnight snack!). A salad can be a vehicle for providing a lot of nutrition, so I set out to make the perfect combo of ingredients. I created a salad that’s both hearty and filled with nutrition. 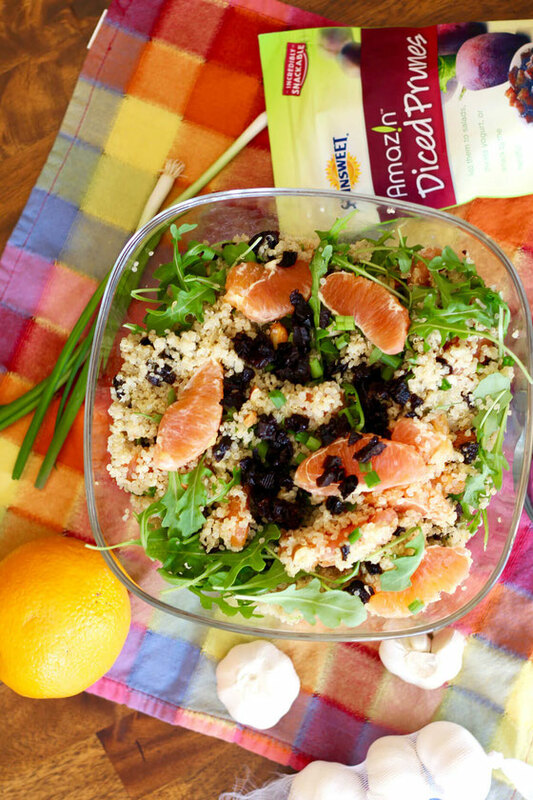 I combined protein-offering quinoa with almonds, scallions, and arugula—and flavored the dish with a sauce made with olive oil, freshly squeezed orange juice, and garlic. I added Cava Cava orange wedges for a dose of immunity-helping vitamin C.
For the perfect finishing touch, I mixed in Sunsweet Amaz!n Diced Prunes. These prunes are the perfect size for adding to dishes. And per ¼-cup serving, you get 12 percent of the daily value for filling fiber, as well as 8 percent of the daily value for blood-pressure-helping potassium. Potassium may help support bone health by helping increase bone mineral density and lowering the risk of bone breakdown. The prunes also offer magnesium and vitamin K, which help bone structure and bone mineralization. Everyone has a reason for eating right—maybe yours is living longer, being more active with loved ones, or just feeling good. So share a photo of your reason for a chance to win $1,500 and a personal session with a nationally recognized nutrition expert. You could also win weekly or monthly prizes (see details for prizes, below). Ready to enter? Here’s how: Submit your photo and your reason for eating right on the “sweepstakes” tab of the Sunsweet Facebook page, or via Twitter, using the hashtag #IEatRightBecause. Note that you can submit one entry per person, per day, and the sweepstakes runs through March 31, 2017. Wondering what you might win? Here you go! Plus, everyone wins because for every photo entered, Sunsweet will donate $1 to the National Osteoporosis Foundation. *Weekly: Poster of the photo with the most votes wins a Healthy Living Gift Basket, including deliciously healthy Amaz!n Prunes, a recipe booklet, a tote bag, a VIP coupon, and more. *Monthly: Posters of the ten photos with the most votes will receive a $100 spa gift card. *Grand Prize: A winner will be randomly selected on March 31, 2017 and will receive the Grand Prize of $1,500, plus an exclusive personal session with a nationally recognized nutrition expert to fine-tune and enhance a healthy lifestyle. 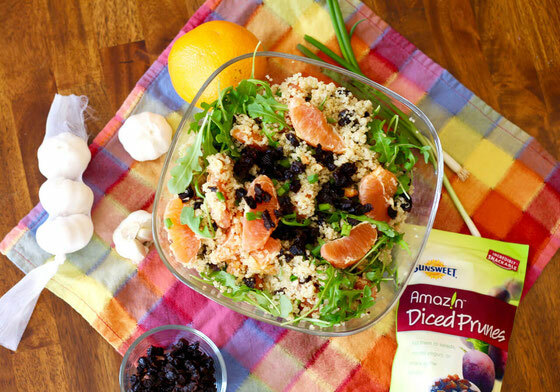 Now that you know all about the campaign, I’d love to share my recipe for my Citrus Quinoa Salad with Prunes. Serve it as a side dish at dinner tonight, and enjoy leftovers for lunch tomorrow! 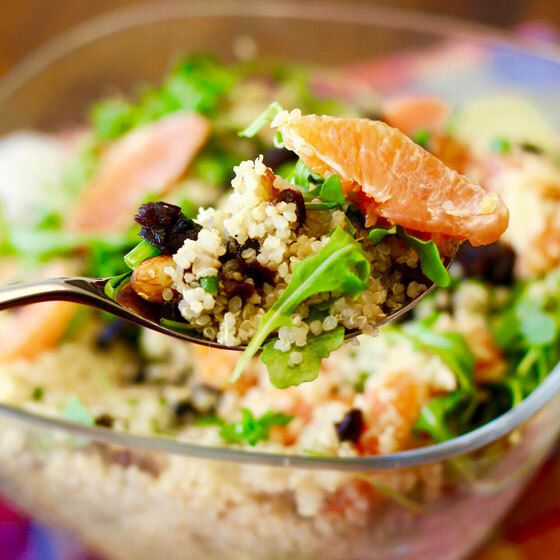 Now that you know all about the campaign, I’d love to share my recipe for my Citrus Quinoa Salad with Prunes. Serve it as a side dish at dinner tonight, and enjoy leftovers for lunch tomorrow! This is one of my favorite prunes recipes, and I hope you love it, too! Prepare the quinoa according to package directions; set aside to cool. Meanwhile, combine olive oil, honey, juice of one orange, and garlic in a small bowl. Set aside. 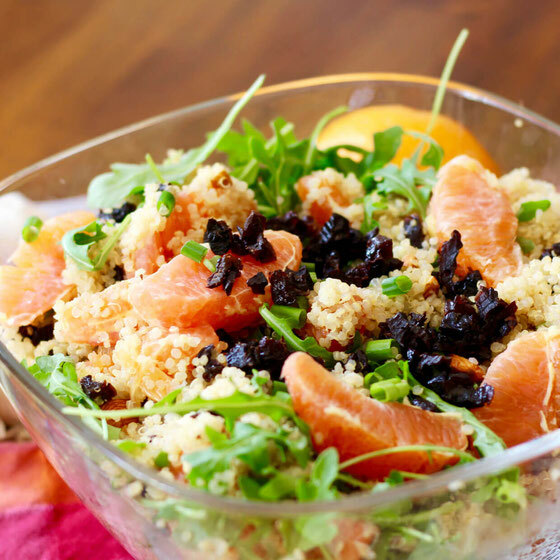 In a large bowl, mix together quinoa, remaining orange wedges, prunes, almonds, and scallions. Combine with dressing. Fold in arugula, and serve. Makes 12 (1-cup) servings. What are your thoughts on this topic? How do you like to cook with prunes? Why do you eat right? Remember to enter the Sunsweet sweepstakes by March 31!